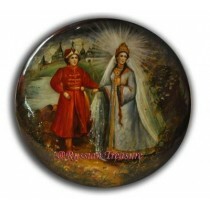 A truly unique piece of Russian artistry, this Palekh lacquer box is brought to you by Russian Treasure. Featuring a famous fairytale “Tsar Saltan” composed by an outstanding poet and writer Alexander Pushkin, this Palekh lacquer box will make an asset even to a rich and sophisticated collection of Russian artwork. The main peculiarity of this Palekh lacquer box is undoubtedly its shape, carved to remind a flower with many petals. The traditional black background, finished with several layers of ebony lacquer, is a perfect choice made by the artist to convey the dramatic atmosphere of the moment and to emphasize the beauty of Tsarevna Swan and the majesty of the surrounding nature. The artist managed to capture the most graceful and stunning scene of the tale on this Palekh lacquer box: Tsarevna Swan appears in front of Prince Gvidon as a lovely maiden who he immediately falls in love with. The colors applied by the artist on this Palekh lacquer box amaze the viewer with their brightness and lucidity, while the shimmering gold leaf over Tsarevna’s head makes the whole image shine from within. Hand-made egg tempera, used to paint this Palekh lacquer box, gives an impression of soft water-colors laid on the deep dark background. The cobalt blue of the waves and the emerald of the leaves together with the translucent snow-white of Princess Swan’s veil make the picture look even more fabulous. The ornament, a lacy masterpiece of silver and gold, rims the box scintillating like a piece of antique jewel. The mirror-like luster achieved by several hand polishing makes the Palekh lacquer box glitter in the sun rays. Resting on the flat bottom, this Palekh lacquer box has a traditional red interior. If you take a look at this exquisite work of art, you will know for sure what kind of gift your most special person deserves and will certainly appreciate.